In 2018 we compiled data from our Community Change Survey (CCS). This Survey targeted over 1000 households enrolled in our programs and also an additional 500 households in adjacent villages not enrolled in our programs. Each survey was extensive, with 4 sections covering economics, health, education, land/agriculture, and satisfaction. Over 250 hours were spent by our team interviewing households in our project sites. Below are a few of the interesting findings between households who enroll (Green - Treatment) and whom are not enrolled (Blue - Control). From this survey of over 1000 households early results indicate that our programs improve human well-being while catalyzing conservation. People enrolled in our programs were more likely to save money to safeguard for emergencies, had shown improved household income, were less likely to engage in hunting/poaching/logging, more likely to make decisions related to family planning and reproductive health as a couple, and overall showed a 98% Satisfaction rate with our organization! 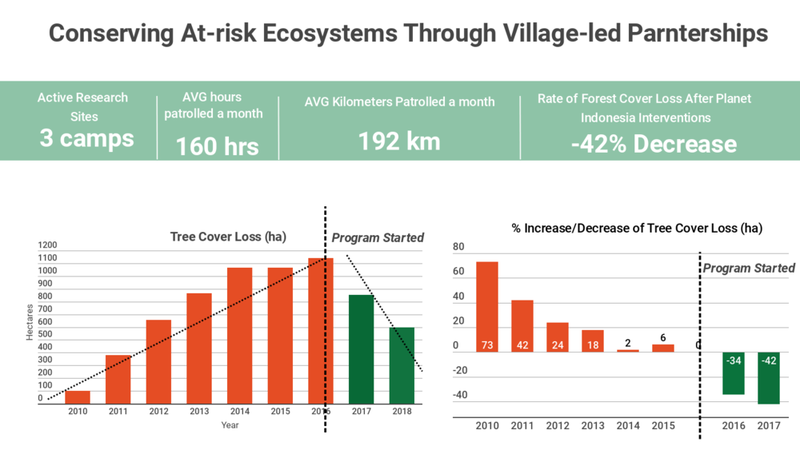 Early Indicators reveal that for the first time in the past 8 years in the Gunung Niut Nature Reserve Planet Indonesia has successfully reversed tree cover loss (note measured at a >75% canopy density). We are aware that we are a young organization, and more time is needed to further measure the positive impacts of our program, measure forest cover loss, wildlife and fishery population restoration, and human well-being indicators. Therefore, these impact indicators should be viewed as early indicators of Planet Indonesia’s success from the past 3-5 years of our work (different programs have different lifetimes). We will continue rigorously testing our model, gathering impact, making refinements, and implementing programs.